Graffiti Junction – 700 E Washington Street Orlando. How can we describe Graffiti Junction in Thornton Park? Is it casual? Absolutely and all the better for it, big screens surround the restaurant area for your chance to enjoy your favorite game or wall to wall bar for beers, cocktails and more. This is a place to kick back and relax, you can even bring your pooch and hang out on the patio. Is it loud? It can be, don’t come here for a romantic meal with your “Honey” unless they are into Sports, Beer and Burgers (sounds like a catch). Have they got great servers? For sure, as they say, “More Gratitude” less “Attitude”, our server Candice was a great example of this mantra, unobtrusive service but always there when you needed something and always with a smile and a “No problem”. We will look out for Candice on our next visit for sure. Most importantly, do they have great burgers? Yes, Yes and a thousand times Yes! 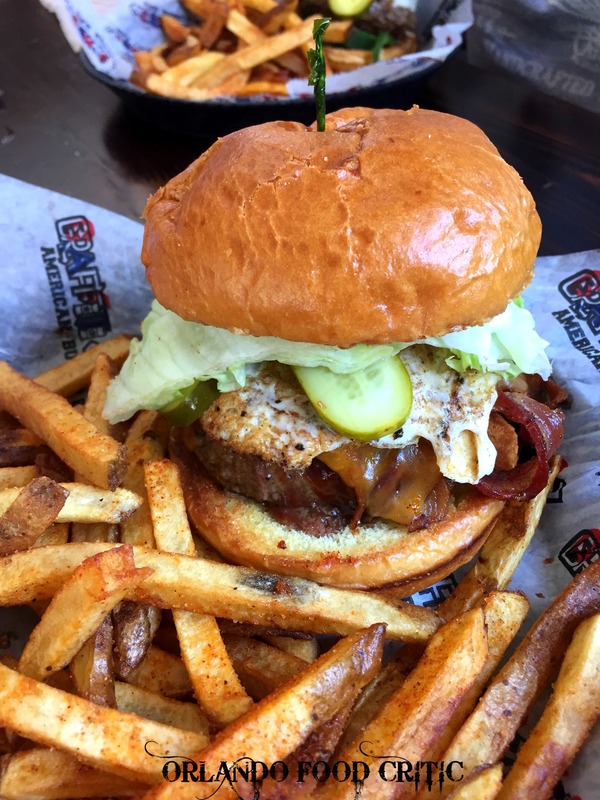 Well-cooked to temperature, just about any toppings you can think of, which you can mix and match to order and they use only 100% Angus Beef, one of the best burgers in Orlando for sure. Lone Star Burger– Bacon. BBQ sauce, cheddar cheese, flour bun. We switched out the flour bun for a brioche and added a sunny side egg. Brotherly Love Burger – Peppers, onions, mushrooms, provolone on a Brioche bun. We switched out the peppers for jalapenos for an extra spicy kick! Both burgers were cooked perfectly and were juicy and full of flavor. Often overlooked, the lettuce was remarkably crisp giving great crunch and the fries were an unexpected star, these are some great fries. Come here for a great burger, neighborhood friendliness and great service. We will be back!